I have always been a supporter of Argentum. In my many years to Essen, Argentum has always had interesting games at the show, many of which I have greatly enjoyed. Most folks know them for Hansa Teutonica, but I have also liked Coney Island and Yunnan recently. El Gaucho is the third design of Fuehler’s that I’ve played this year (which also happens to be all three of his games in the BGG database) – the others being Pagoda and Scharfe Schoten. 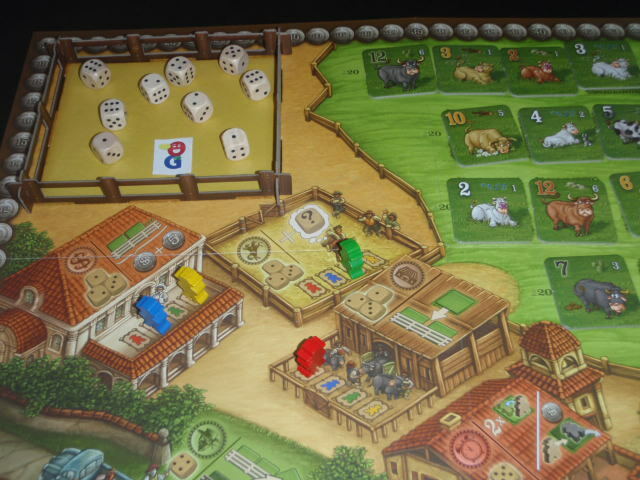 El Gaucho is a lighthearted game about going to the dice rodeo and then collecting high scoring cattle. Yeah, I know that doesn’t make much sense, but that’s what it says on the back of the box! The subtitle of the game is a bit more revealing: “A set collection and take-that game”. The board has four large pastures where you can find the cattle. ON the other side of the board are 6 different action areas where you can place some of your worker tokens. Finally, in the upper left corner, there is a little fenced in area where the dice rodeo happens. There are actually holes in the board where you put stick fences in to make the rodeo area. There are five different colors of cattle, with each color having tiles numbered from 1 to 12. At the start of the game, the four pastures are filled. Random cattle tiles are drawn and placed in pastures until the total is 20 or more in a pasture. 4 cattle are placed on the Steppe area and the rest of the tiles are left to draw from. 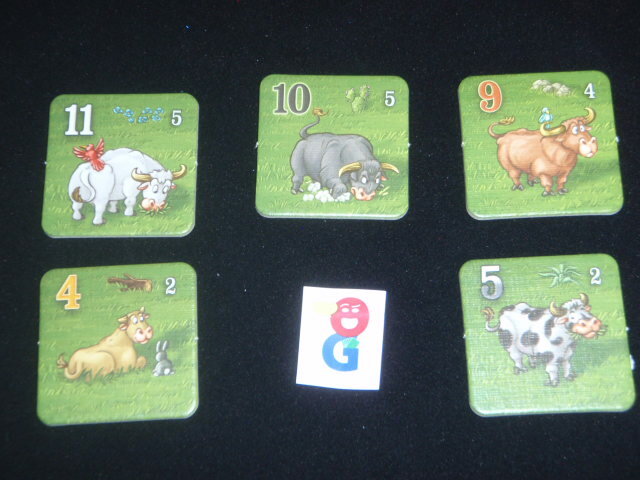 Before the game starts, each player is dealt 3 random cattle tiles. They can keep 3 if all are value 4 or lower, keep 2 if both are under 8, or choose to only keep one. 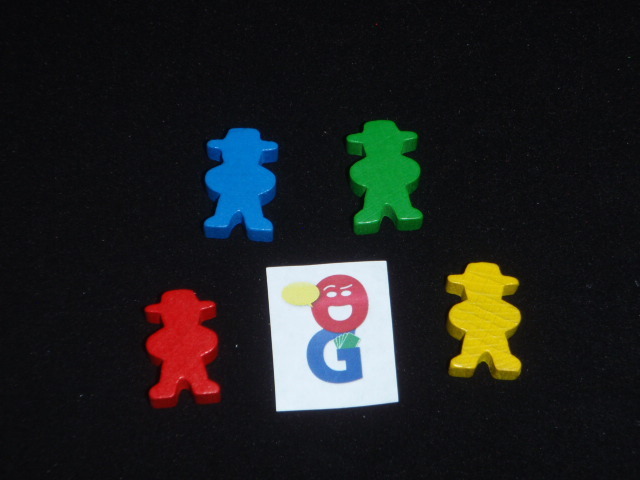 Each player then gets to place a Gaucho token on one of the special action areas. For each round, the Start Player rolls all the dice into the Dice Rodeo. Then, on a player’s turn, each player chooses two of the available dice from the Rodeo and takes their actions. What can you do with your dice? You can try to collect cattle. Each cattle tile has a big number (equal to its value) and a smaller number. IF you pay dice exactly equal to the big number, you can stand your gaucho upright on that cattle tile and claim it. IF you play dice exactly equal to the small number, you can lay your gaucho down on that cattle tile and half claim it. If you later play the small number again, you can then stand your gaucho up and fully claim the tile. You could also use your dice to put a Gaucho in one of the six special action areas. Each of these areas requires a certain number – seen on the area in question. When you place a Gaucho on any of these, you are reserving an action for a FUTURE turn. You may never use a Gaucho in an action area on the same turn that you place it. I’ll describe the actions later on when it’ll make more sense. In any event, the round continues until all players have chosen two dice from the rodeo and taken their actions. Then, once everyone has played, you check to see if any cattle are collected. In each of the four fields, if there is a gaucho on every tile (either standing up or lying down), then all standing Gauchos collect the tile they are standing on – both the Gaucho and the tile are returned to the player. Lying gauchos simply stay lying down on their tiles. All collected cattle from this turn now have to be placed in your herd(s). Each color of cattle is kept in a separate line. The herd is valid as long as all of the cattle are in strictly ascending order or strictly descending order. Any new additions to the herd must always be on the Right side of the line. If you ever have to add a tile to a herd which breaks the numerical order, that herd must be sold and the tile which didn’t fit will start a new herd of that color. When it’s time to sell a herd, each tile in that herd is worth a number of Pesos (VPs) equal to the highest numbered tile in the set. Thus, 2-4-6-7-11 is worth 55 pesos because each tile is worth 11. All sold tiles are discarded from the game. Once all herds are grown and sales have occurred, then it’s time to refill the pastures. You again draw tiles at random from the supply until each pasture has a total of 20 or more. If the draw pile is empty, then you fill what you can and the game continues for one final round. You don’t roll dice in this final round, you can simply use any Gauchos placed on special action spaces from previous turns. Which means it’s probably time now to talk about those special action spaces. Sort (1,2 or 3) – you can place one newly acquired Cattle tile anywhere in your herd, not just at the Right edge. Gauchos (5) – You can either stand up to 2 Gauchos that are currently lying down OR replace one of your opponent’s lying down Gauchos with one upright one of your own. The displaced opponent also gets Pesos equal to the value of the tile. 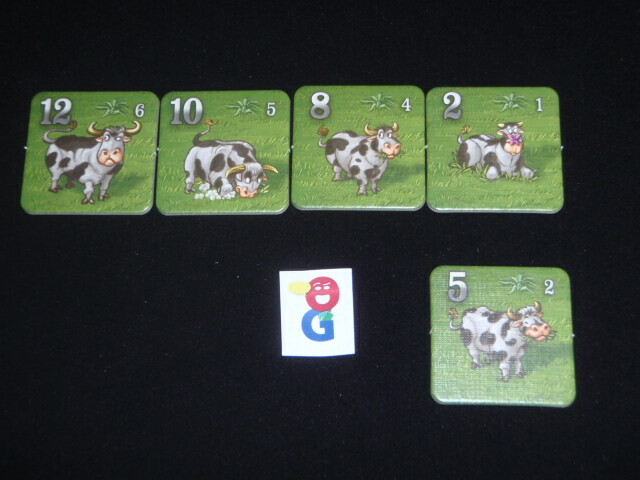 Secret Cattle (6) – You can look at the 4 facedown tiles in the Steppe and keep one or two. If you keep 2, they must both be 4 or less in value. These tiles are placed in any empty pasture spaces with an upright Gaucho on your own on top of them. Draw tiles to bring the Steppe up to 4 tiles. 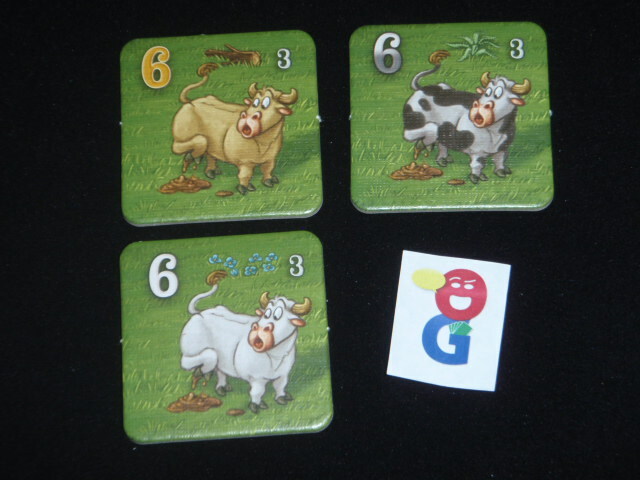 Again – when the supply of cattle tiles is out, you finish the current round and then play one final round. In this last round, no dice are rolled; players may only use their previously placed gauchos. At the end of this round, ALL cattle tiles that have upright Gauchos on them are collected and placed in the usual fashion. Finally, any unsold herds are now sold in the usual way. The player with the most Pesos wins. 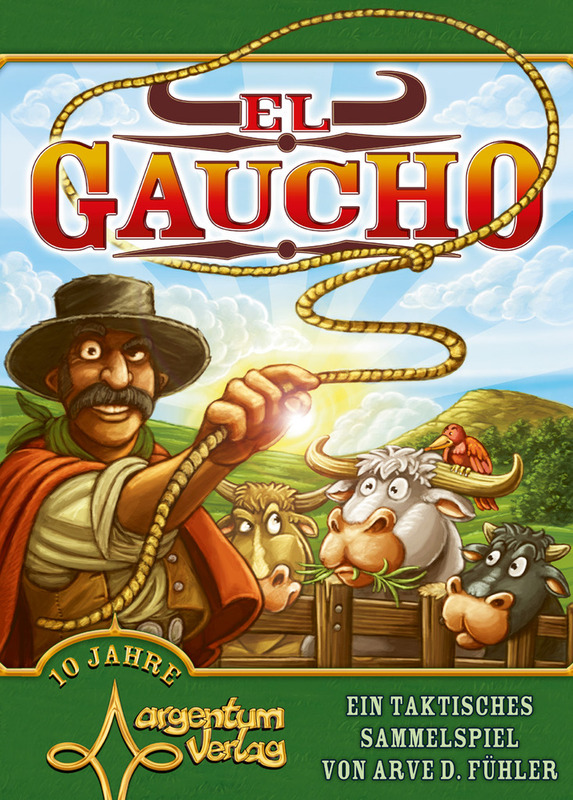 El Gaucho is an interesting mix of two different genres – Hand Management and Take-That. Luckily for me, the hand management aspect seems to be predominant. I’m honestly not the biggest fan on take-that actions, and I was a bit worried when I had read the rules prior to Essen. The stealing cattle is really the only targeted special action, and you can usually see it coming at you because there is at least a one turn delay between the placing of a Gaucho on the “steal cattle” action and the time that an opponent can use it. Furthermore, with enough advance planning, you can even short circuit an attack with an “immediate sale” or by a well timed cattle tile collection to trigger a sale. There is an interesting timing aspect to the special actions. First, you have to wait at least a whole turn before you can use a special action, so you’re often banking actions that you’re not exactly sure how you’re going to use. Sometimes, you end up choosing the special actions because it’s the only play left to you from the dice. However, you can’t sit on them forever. As you can only have one Gaucho in each special action area, you want to make sure that you have some of them free for your turn or else you might severely be limited in your options. Like any game with targeted attacks, you have to have slightly thick skin to absorb the attacks when they come your way. My guess is that every player in El Gaucho will be the target at least once… In our experience so far, the attacks aren’t always targeted at the leader though – there are times when you just need a specific cow tile, and you’ll end up taking it from whoever has it. And, if you’re usually targeted, you may just need to change your strategy so that you’re not a target for long – use the special actions to steal tiles and immediately sell them before anyone else can take them away from you. The artwork in the game is light and colorful, and in true German fashion, there’s poop involved on some of the tiles. After all, can you really have bulls without bullsh**? The tiles are nice and thick, and the raised fence rails of the dice rodeo look nice. Overall, I have found El Gaucho to be an enjoyable family game. There is enough strategy in the cattle tiles and special actions to keep everyone busy, and there is just enough interaction/take-that from the stealing cattle to make the game unpredictable and keep all the players in the running until the end. El Gaucho is a very good game, and one that I have enjoyed thus far and will continue to play through the year, but I doubt that it will become an evergreen in my collection either. Joe Huber (1 play): For me, El Gaucho is impressive in that it involves take-that elements, but still rises above being not-for-me. I don’t love the game, but I could play it again, as it’s clever and lighthearted enough (and the take-that is tempered enough) to be reasonably fun. But that said, I won’t be seeking out more plays, and won’t be upset if I don’t happen to play it again. I played this just once, unfortunately with one key error — we didn’t do the preliminary setup round. Still, the game did play pretty well. Unfortunately, the take that parts (steal a cow from their collection, steal a cow from their laying down meeples), despite being broadcast 1+ turns in advance, were too annoying for most of us! That was especially the case at the end of the game, when it made sense to preferentially target the players after you in turn order. With our rules error, not only did the 3rd and 4th players have a bad start (last selection of dice and cows to start their herds), but they were again screwed at the end of the game. Even with the proper setup, though, there is probably too much take-that in this game for my own tastes. Of course, I’m sure I’m in the minority — I feel similarly about Alien Frontiers and that game is kind of popular! For a less sensitive group, this game would probably be a lot of fun! I am glad they broadcast the “take that” aspect of the game right at the beginning of the rules! I like but don’t love it. However, after one play, my kids are really eager to play it again. In fact, their reaction is why I haven’t listed it for trade. I completely agree with Dale’s assessment. In fact, the only issue I have is that (with very limited exceptions) the higher dice are always better than the lower ones. That means deciding which dice to take on your turn is very rarely a decision. Other than that, I liked every aspect of it and the dice corral is great!